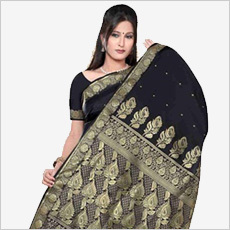 Sari Fabric is the traditional dress of women in India. 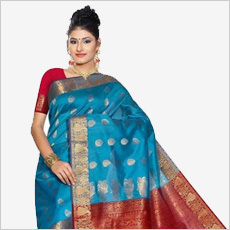 It is an outer garment worn by a woman consisting of a single length of cotton or silk, 5 to 7 yards long, most often with one end wrapped around the waist to form a skirt, the other draped over the shoulder, or head. It is worn over a short, tight top (called Choli or Blouse) with short arms and a thin underskirt of plain cotton (Petticoat).